Why Choose Our Industrial Rosin Press? 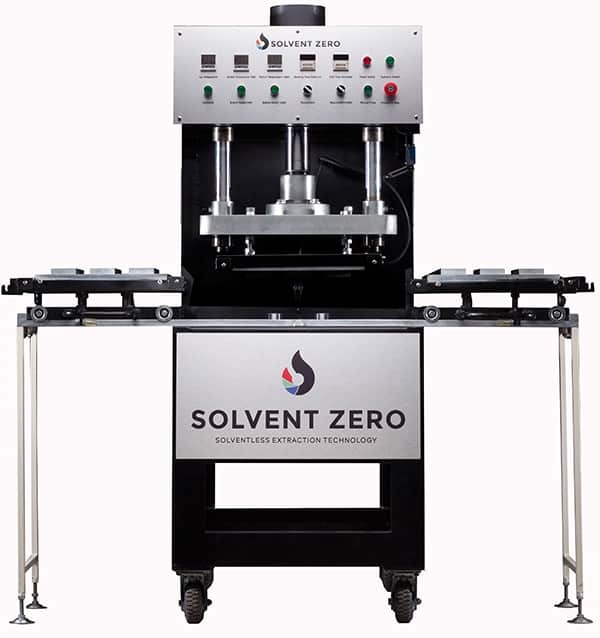 Solvent Zero’s technology is the world’s first patent-pending commercial scale solventless extraction method capable of processing 40+lbs of material per day with maximum yields and quality. Simple to use, non-volatile extraction method, kind to the planet. Absolutely no chemicals or solvents are used. Finished product meets all health and safety standards. The Solvent Zero Machine produces a pure finished product ready for consumption immediately. Our commercial rosin press can produce a variety of popular concentrate forms such as shatter, wax etc. The Solvent Zero solvent-less rosin extraction machine can be purchased anywhere in North America, South America, Australia and parts of the EU. “My CO2 extraction equipment investment was in the upwards of 1/4 million dollars! This comes at the fraction of the price, with a fraction of the footprint and anyone can operate this machine! “It shipped right to my business and was easy to unload and assemble verses some of the previous C02 extractor equipment we have purchased. "Solvent Zero saved me hundreds of thousands of dollars and it has no solvents. I found the process simple and the equipment easy to use"